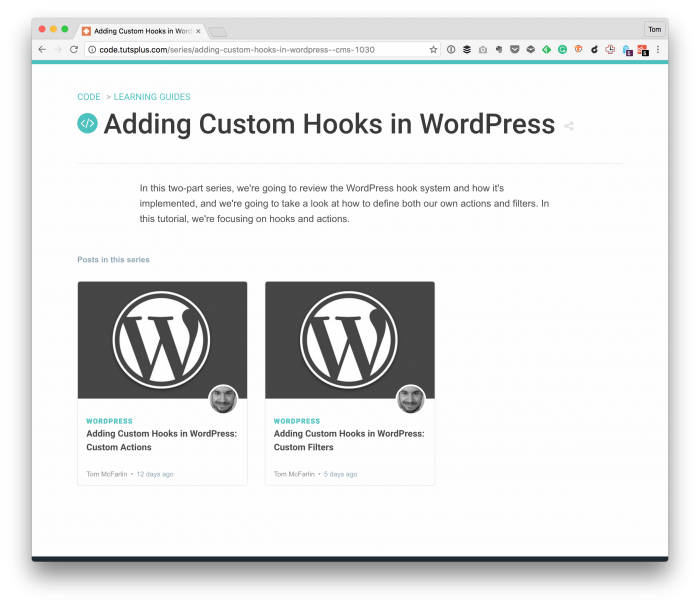 WordPress hooks are arguably the foundational topic that developers need to learn and understand when it comes to building more advanced functionality for WordPress. But if you’re someone who’s new to WordPress or who is ready to take the next step regarding extending the platform or writing a plugin, then it’s important to understand to know what WordPress hooks are, how they work, and what they’re designed to do. And that’s what I’ve covered in my latest series on Envato. I know that some people who read this site are already familiar with hooks and how they work. I’ve even written about them before. Over the years, I’ve gained more experience and perhaps a better way of explaining them. Furthermore, people get started at different levels of WordPress development every single day. And as cool as that is, there are times that it’s important to rehash a topic that has been previously discussed. That’s why I don’t mind talking about things multiple times (plus, WordPress advances every few months, so new things are introduced, can be learned, and are worth discussing). 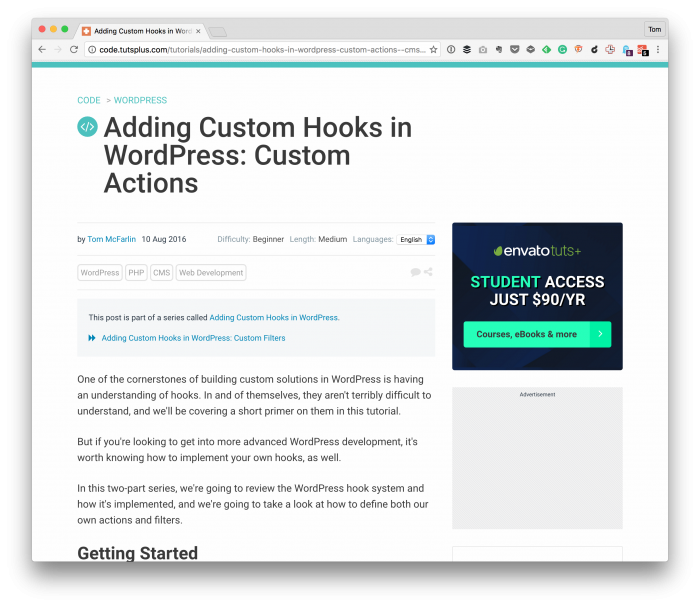 WordPress hooks come in one of two types – actions and filters – and actions are the type of hooks that allow us to help work with custom functionality in WordPress. Actions are points in the WordPress lifecycle that allow you to add, remove, or modify certain functionality. In this part of the series of articles, I share code that works on registering a new WordPress menu, a new WordPress submenu, a custom post type, and custom administration messages. The ultimate point of the article isn’t so much about building a complete plugin but forming a solid foundation of understanding of what actions are and how they work. Filters, the second type of WordPress hook that we have available, give us the ability to work with data. Filters, on the other hand, are points in the WordPress lifecycle in which you can add, remove, or modify data. This article looks at how we can create custom filters to manipulate data that will be displayed on a WordPress page or post. Furthermore, it also talks about how to create our filters and apply them within the context of a theme or plugin through the use of apply_filters. Similar to its companion article, this piece is meant to show how to work with existing filters, define our filters, and how to use existing functions to hook our functions into WordPress APIs. 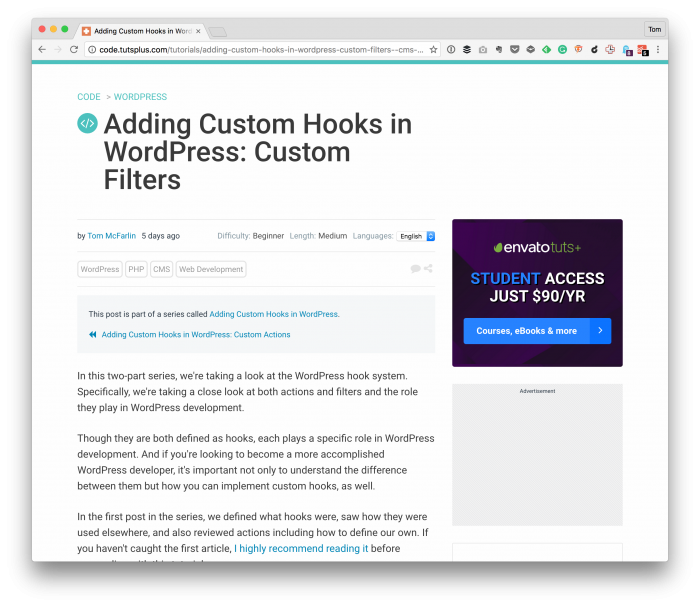 If you have questions or comments about anything regarding WordPress hooks (or actions or filters) then please comment on one of the original articles. At any rate, the above two articles are the most recent set of articles I have that serve as a primer on the topics.